It’s a super simple, fool proof method and best of all – no need to peel raw beets. After roasting, the skins just slip right off you won’t believe how easily. 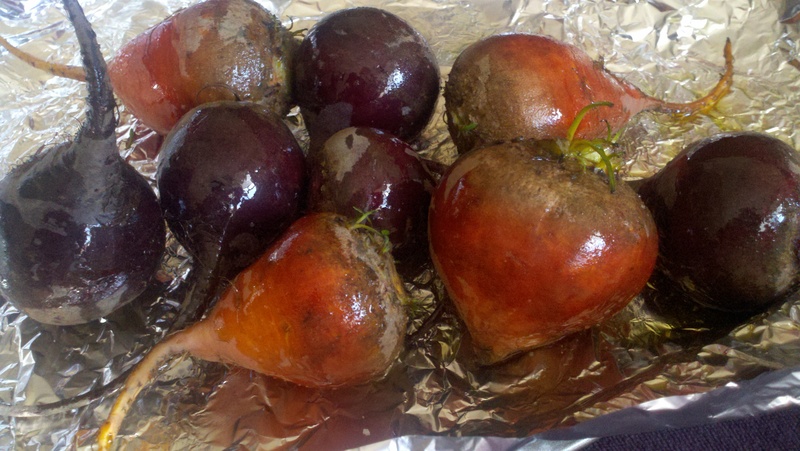 Once you try it, I promise roasting will be your go to way to make beets! Roasted beets can be tossed with a vinaigrette, glazed over rice, mixed with hummus or as a topping for skordalia to give you some quick ideas. The ways you’ll find to use them will be endless. Wash, wash, scrub and rinse your beets to get the dirt off. Especially if they’ve come from a farmers market or garden, beets can be very dirty! They do come out of the ground so it’s ok but you don’t want dirt grit in your food. 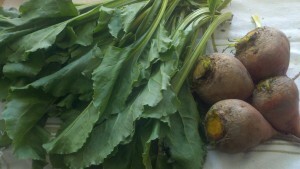 If your beets still have the leafy greens attached, using a sharp knife, cut the greens where they grow from the beet bulb. It’s ok to do this before washing your beets. I sometimes like to have the greens to hang onto as I wash and cut them off once I’m done. Set the greens aside. Cooking instructions for beet greens here. I leave the string end of the beet on as it gives me something to hang onto when peeling but feel free to discard if you’d like. On a flat baking sheet, place a 12-18 inch long piece of aluminum foil. This will hold anywhere from 8-10 small/med beets. Toss the cleaned, unpeeled beets in olive oil and salt. Place beets lengthwise on the foil in a line 2 across for smaller or end to end for larger. Pull up either side and pinch the ends together to completely enclose beets in the foil packet. 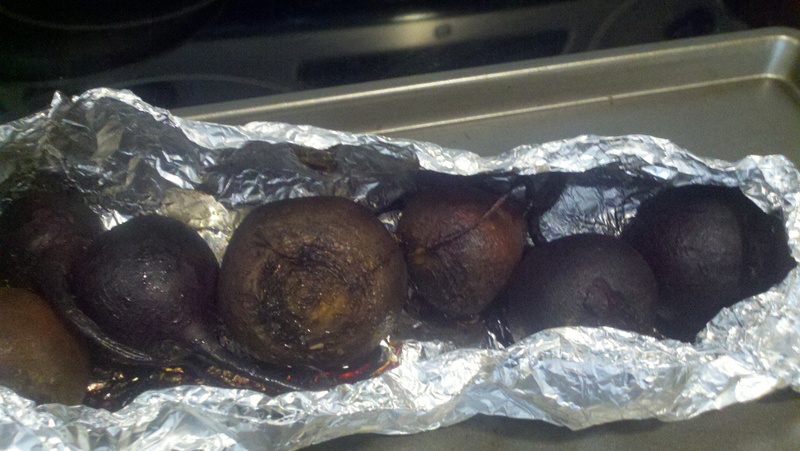 If you’d like to roast more beets at one time, just use additional pieces of foil on the same pan. You’ll be able to fit as many as three or four on a medium size baking sheet. Roast beets at 400 degrees for 50-60 minutes. 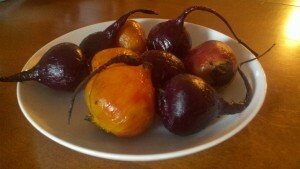 50 minutes is usually fine for small/medium beets. If you are roasting ones more than say 4″ in diameter, I’d leave them in for 60 minutes. Don’t worry about mixing sizes in your packet. The smaller beets will be fine even with the extra time. 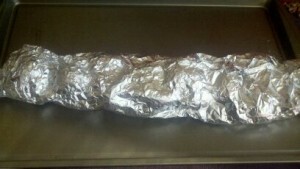 Once out of the oven, open foil packet being careful of the steam. Let the beets sit for at least 15 minutes before attempting to handle. When they are cool enough, gently rub the skin away from the beet. No need to use a knife. Don’t save the skins, off to the compost they go. 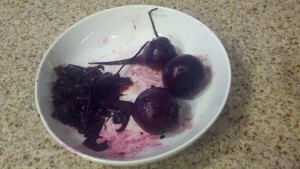 You may want to think about using gloves especially when handling red beets. If you’re going to dive in old school, just soak your dyed fingers in a mixture of lemon juice and a little salt for few minutes. Rinse and you should be fine. From here you’re limited only by your imagination. 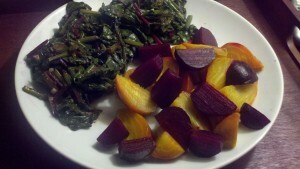 A suggestion when tossing in a vinaigrette, do this while beets are still warm. The warm beets just soak up the flavors. Thank you KiKi ! This is the only way I cook my beets any more. Easy & SO fabulous! I love beets! I can’t wait to try them this way. Aluminum foil is soo bad for us, though. I’ll try with parchment paper. Should be great!